NEWS: Emirates Airlines is to introduce in-flight Wi-Fi connectivity on its fleet of Airbus superjumbos. The system, called OnAir, lets you access the internet via any Wifi enabled computer. The service will also connect to the airline's in-flight entertainment. Initially OnAir will be installed on 11 of the 19 A380s currently in service. Emirates operate an exclusively wide-bodied aircraft fleet made up from 3 aircraft families: the Airbus A330 / A340, Airbus A380 and the Boeing 777. Indeed, reflecting the nature of Emirates operations - with no real shorthaul network to speak of - it is one of only nine airlines to operate an all-wide-body aircraft fleet, and Emirates is the now the largest in the world in terms of scheduled international passenger-kilometres flown. Emirates seats vary wildly according the aircraft manufacturer. Try and fly on the new Airbus A380 planes, as they offer a much better seat in all classes than the older and cramped Boeing 777s. 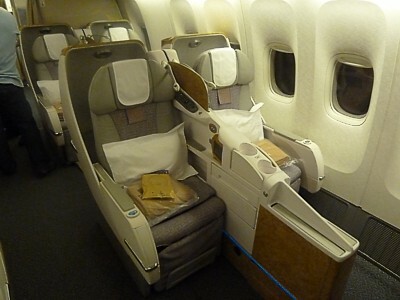 All the planes are decked out with a light and airy decor, in soothing beige colours, which really does work. The cabin before passengers sit down really does look inviting. 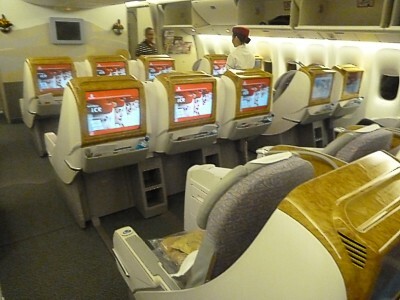 At all seats in all cabins you will get a seatback TV on Emirates: Read more about Emirates IFE. First Class comes in two variants. The full suite and the regular first class seating (called the 'Skycruiser' seat). In the new A380 and long haul A340s it has its own separate cabin for each seat. These are truly sumptuous, with a mini-bar, and sliding doors so you can shut off the rest of the cabin. There is even a coat rack and plenty of drawers for storage. The suites also feature the ICE system on a huge widescreen 23 in LCD screen. The seat converts into a 2 meter (6 ft 7 in) fully flat bed. 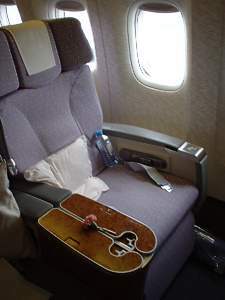 The other option is what is called the Skycruiser seating is offered in First Class on some aircraft like the Boeing 777-300ERs, Boeing 777-200s and Boeing 777-300. These are much more conventional, with a strange upright minibar beside your seat, and a 19 inch video monitor. 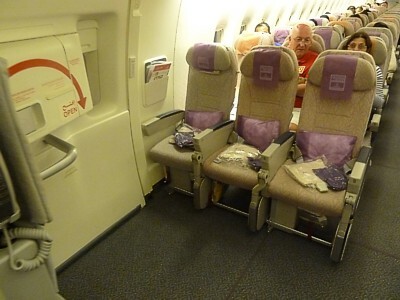 These seats are comfortable enough for a 2 or 3 hour flight, but only so-so for a full longhaul flight. Never the less, if there is more than one of you travelling in a group, these seats may be better as they are far more sociable. 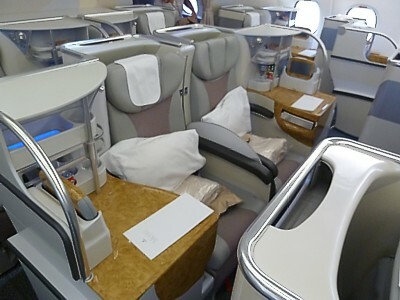 There are no less than three variants of the Business Class seat on Emirates. 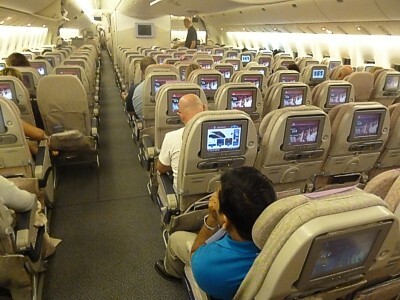 The best seat is to be found on the A380, but on the Boeing 777 although it looks better, doesn't go fully flat. On Airbus A380-800 aircraft, the seats are unusual: half of the seats are much shorter than the others, thanks to a wacky staggered design. Each seat faces to the front, however when sliding into a flat and level bed, it slips into the minibar pod in front: consequently the aisle seats (B, D, G, J) have a shorter 70" (5'10") bed, while window and middle seats (A, E, F, K) are longer with a 79" bed. You can save seat and in-flight entertainment settings to a USB Stick. There is an mini-wardrobe, in-seat mini-bar and a larger walk up bar with sofas at the rear of the cabin. This is the seat you want at all costs. 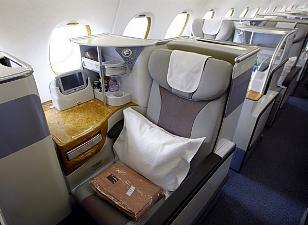 Emirates Business Class on the Boeing 777 comes with a standard slumber, but not flat, seat. It reclines to about 25 degrees, but with a lot of lumpy padding. It is 79 inches long, and described as an angled lie-flat bed. There is an in-seat power supply, USB Ports and an RCA socket for laptop connection, over 600 channels of entertainment on ICE, shown on a 17 inch (43 cm) wide TV screen. The main problem with this seat is that you lie at a slant: after eight hours of this, it can be pretty tiring on your ankles as you keep on sliding off the seat. This leads to chants from business class passengers that "If it isn't Airbus, I'm not going." The Airbus Business Class seat is so much better. On the A340 the seat is very much an old classic business class seat, with a cocoon around you, and the recline doesn't go into the seat behind, with a 60 inch (150 cm) pitch, and an 18 inch width. 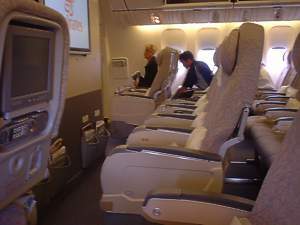 These business class seats are smaller than other business class seats, but the A340s aren't used for very long routes. Remember that if you are travelling in Business or First class, you also get access to the lounges, and you can take advantage of Emirates chauffeur drive service. With this you are offered a car to pick you up at your origin, and deliver you at your destination. In Economy Emirates boasts a seat pitch of 32 inches on most Airbus aircraft (except the early ultra long range A380s), and 34 inches on the Boeing. Never the less, you should always choose the Airbus over the Boeing on Emirates. Why? Well, the 34 inch pitch seems great, and does allow you to stretch out on the long-haul flights. It's a good sales tactic, and looks good in comparison tables. 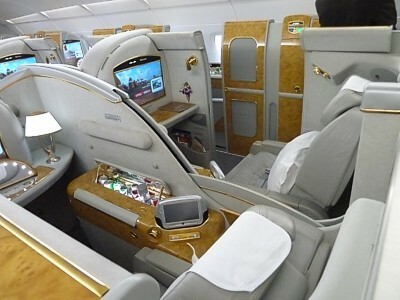 However as soon as you sit down, you notice how Emirates makes money with such luxury. What Emirates do is add in one extra row of width, which means it can squeeze in more passengers than other airlines by having one of the narrowest seats in use on the 777s. With a full plane, the 3-4-3 layout becomes pretty uncomfortable, and Emirates is one of the few airlines to offer such cramp conditions in economy. Luxury, it isn't. Emirates A380 Economy Class also offers a 3-4-3 layout, but it is so much better, with much more width: 18.1 inches no less, along with a recline of 35°. There is a 10" seatback TV. NEWS: Emirates is expanding the number of routes on which it operates the A380, to include Melbourne and Tokyo, plus resuming A380 flights to New York's JFK. However, on newer models of the A380 it plans to increase the economy seats, reducing the area per passenger, to carry 427 passengers in economy. A large part of this increase comes from removing the cabin crew dormitory in the rear of the economy class cabin. The Emirates A380 is defintely the plane you want to be on in all three classes. It is much more comfortable than the Boeing 777, and should be taken at all cost. It is the only commercial aircraft with inflight showers, although to a certain extent, this is just a marketing gimic. Emirates currently has twenty A380-800 in it's fleet, making it the largest operator of the A380, and it has a whopping 105 more planes on order: when all of these are delivered, Emirates A380s will dominate its routes. There are two types of A380 in Emirates fleet. The ultra long range version has 399 economy seats, plus the basic long range version with a seat layout of 427 economy seats. A large part of this increase comes from removing the cabin crew dormitory in the rear of the economy class cabin, and other than that, it is pretty much the same plane, although there are minor differences, such as an extra middle row 51 ahead of the second set of doors. Check out the full online Emirates A380 Seating Plan with pictures of every seat to help you find the best seat in every class. 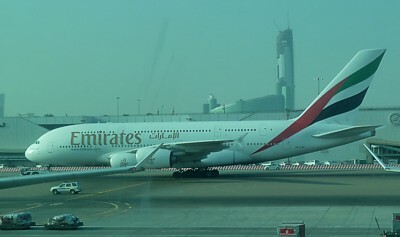 The ultra long range version of Emirates A380-800 seats 489 passengers, and features 14 first class "suites", 76 business class "pods" and 399 economy seats. In newer model planes it plans to squeeze up the economy seats, reducing the area per passenger, to increase the cattle class cabin to 427 passengers. These planes are not exactly recommended. 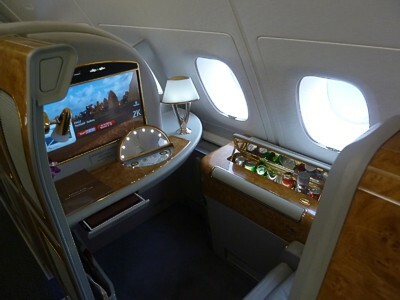 First Class is what the newly delivered A380-800 was designed for. The first class suites really are rather good: just feel how soft that leather is! 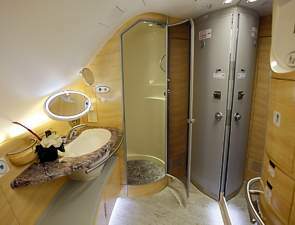 The seats recline into a fully flat bed, there is a work desk and built-in illuminated vanity mirror, a personal mini bar (it is electrically controlled: take a drink and the crew replace it) and what is called "room service". In effect this means you can press a button, and the crew come to you, just as in economy. The TV screen size is 19 inches, which is a bit of a disappointment compared to the 24 inch monsters on some other airlines. There are two shower spas available to first class passengers on a booking system that allocates about 20 minutes to each passenger, although there bookings often come at an extreme premium (particularly on the short run to Auckland). In First there is a small stand up bar, at the top of the stairs, and there is also a larger bar between First and Business, which also serves canapés, in a similar manner to that on Virgin Atlantic. 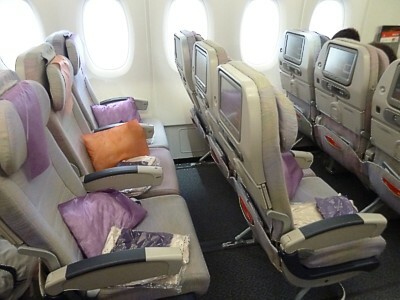 In Business Class the seats recline to form a fully flat bed and are equipped with personal mini-bars. Business Class actually seems a step down from that in pervious generations of Emirates Aircraft, with the previously large and heavily padded business class seats being replaced with a narrower, harder version in order to make way for the new gadgets, but in operation is actually more comfortable, even though the seats are unusual: half of the seats are much shorter than the others, thanks to the staggered design. Each seat faces to the front, however when sliding into a flat and level bed, it slips into the minibar pod in front: consequently the aisle seats (B, D, G, J) have a shorter 70" (5'10") bed, while window and middle seats (A, E, F, K) are longer with a 79" bed. The problem come for couples sitting together: it is hard to get two seats next to each other. The only options are the middle seats E and F, and these fill up quickly. The gadgets around the "pod" include a mini bar (a bit of a disapointment, as it only has water, coke and juice), a privacy panel between the seats, small laptop and shoe compartments, and a touch screen seat controller for the in-flight entertainment system, which can also show a map while you watch films on the main screen. 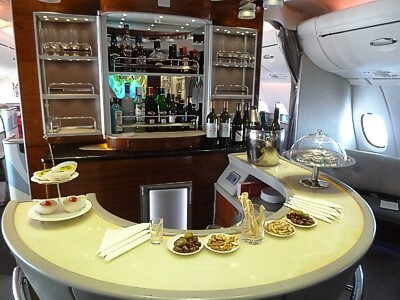 Business class passengers also have access to an on-board bar that is right at the rear of the top deck of the aircraft, although it's a pretty small semi-circular affair. In this bar there is a huge 42 inch plasma screen showing sports, and the bar can get pretty lively, particularly on flights out of Sydney, and onto Heathrow. The bar is situated behind the rear mini-cabin, which is highly popular, having just four rows of business class seats, in row 22 to 25. It can be a lot quieter than the main cabin. Economy Class on an Emirates A380 is a pretty standard economy class, in a 3-4-3 layout. The Ultra long range version has a 34 inch pitch, however newer aircraft (the basic long range version without the dormitory) only have 32 inches between the seats. At least the headrests are adjustable, and there is the full one thousand channel ICE AVOD Entertainment System where you can stop and start at will, and in-seat laptop power-outlets. Windows on the A380 are much larger than normal aircraft windows, and make the cabin much lighter. Quite unusually for an A380, economy occupies all four sub-cabins of the lower floor of the Emirates A380. This means you can get an economy seat in the nose: row 43 is popular for just this reason, however it is right next to the block of five toilets in the nose of the plane: some cabin crew call this section the flying lavatory, and queues in the nose after the meal service can be lengthy. Row 52, 67, and 80 are emergency exits, with a lot more legroom. Interactive colour seating chart for A380 Emirates, with pictures of every seat in every cabin layout for the EK A380-800. Emirates uses the Airbus A380 on flights to London Heathrow, and Manchester, as well as Sydney then on to Auckland, Toronto, Paris, Bangkok, Seoul, Beijing, and Jeddah. The Jeddah route has a flight time of less than 3 hours, however it is so popular it warrants an A380, the shortest route in the world it is used on. The second shortest route is from Sydney to Auckland, also scheduled at three hours. Tickets in premium classes on the A380 on this route can be quite cheap, and so it has become a way for passengers to try First on the A380, at a bargain price. 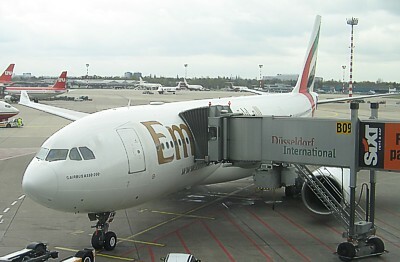 Emirates flies both the 777-200 and the larger 777-300. There are three Boeing 777-200, six Boeing 777-200ER, 10 Boeing 777-200LR), and a whopping 52 777-300ER (with 19 on order). gets cots clamped to the forward wall. Row 23 gets an emergency exit, but no windows at all. Row 37 is the best bet, getting a slim sliver of a window, a window in the door ahead of you - and its not over the wing. If you are in a bulkhead or an emergency exit you get a fold out video screen which is smaller than the seat back videos, and your remote is in the armrest, so you keep on banging it when you are asleep. For this reason on Emirates 777s, the bulkhead seats are not as popular as normal seats. These seats have a video screen in the ceiling, so you can enjoy the view from the camera in the nose of the plane on landing when your screen is stowed. Interactive colour seating chart for 777-300 Emirates, with pictures of every seat in every cabin layout for the EK 777-300. 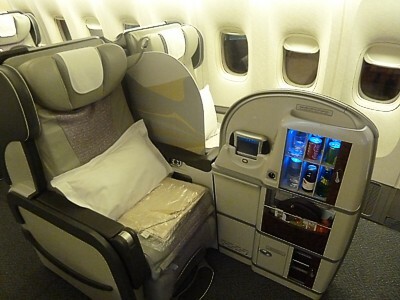 In Business or First Class you should always take the Boeing 777-300ER over the Boeing 777-300. The Emirates 777-300 in Business has seats in a 2-3-2 formation, with one cabin having four rows of seats with row 8 getting a bulkhead with cot fitting and a danger of children, and then ahead of the galley there are a further two rows of seats, with row 6 being the bulkhead, but with no cot fittings. The Emirates 777-300 Seating Plan shows this is by far the better cabin. All seats come with a fold out video screen. These seats are of the recliner rather than lie flat type. First comes in a 2-2-2 pattern, in 3 rows. In First the seats are very poor, with just the 'Skycruiser' lie flat recliner, and odd vertical minibars by each seat. By contrast the Emirates 777-300ER in Business is totally different beast, with the same type of seats you get in the A380, with fully lie flat business class seats. Between First and Business there is a combined bar area and lounge. The walk up bar is pretty small, and it seems rather like having a drink on a British Rail train, then slumping down in a South West Trains seat, but at least the drinks are pretty classy. 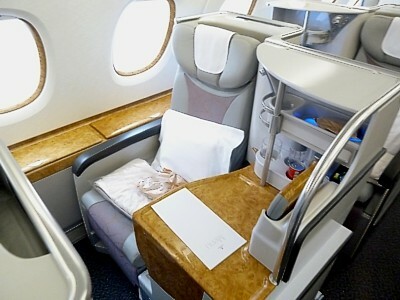 And the Emirates 777-300ER has proper suites in First Class. Emirates has 29 of the twin-engined Airbus A330-200, 8 of the four engined A340-300, and 10 of the giant sized 340-500, which has the longest range of any commercial airliner, 8,650 miles, allowing it to fly direct from Dubai to Sydney. Another of the delights of this plane is the unusual lighting system, which projects stars onto the ceiling of the cabin, giving a "Night-time in the desert" effect. It does work - really it does - in helping you to sleep. are a bit unusual: they are half folding ones. Slide the catch down to unlock the first half of the table, then fold out the second half. They also include a good cup holder when left up. 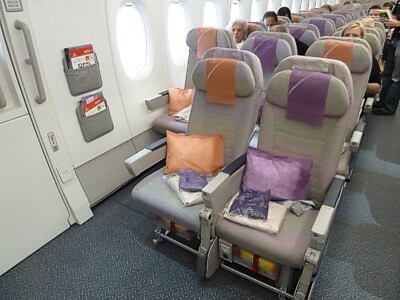 Business Class seats are in a 2-2-2 formation, with one cabin having five rows of seats with row 8 getting a bulkhead with cot fitting , and then ahead of the galley there are a further two rows of seats, with row 6 being the bulkhead. On the A340 the new Business Class seats are fitted, with a cocoon eggshell around the rear of the seat - so that you don't notice when the person ahead of you reclines their seat. First Class comes in a 1-2-1 pattern, in 3 rows, with each seat having its own cabin separated by sliding doors.